Successfully Added 1080p Hunting Camera - 25m PIR Sensor, 20m Night Vision, IP66 Waterproof, 12MP Pictures, 6 Month Battery Life, Full-HD Video to your Shopping Cart. Now that the hunting season is about to start, it is the perfect time to invest in a high-end hunting camera. This trail camera is great for keeping track on game and analyzing their daily routines. The camera itself features a waterproof IP66 design and can last for up to 6 months in standby time. Therefore, you’ll be able to leave it unattended throughout the entire hunting season without needing to worry about battery life. Capable of withstanding temperatures between -30C to 70C, this hunting camera is guaranteed to operate in any environment. This Full-HD hunting camera treats you to crisp and detailed 1080p footage. It is furthermore capable of shooting sharp 12MP pictures of all wildlife activity in the area. Thanks to its PIR sensor, your trail camera will automatically shoot a picture or video whenever movement is detected within an area of 25 meters. It supports a 32GB SD card in which it allows you to store all your previous recordings. The camera features a built-in microphone due to which it is able to record sound along with visual images. 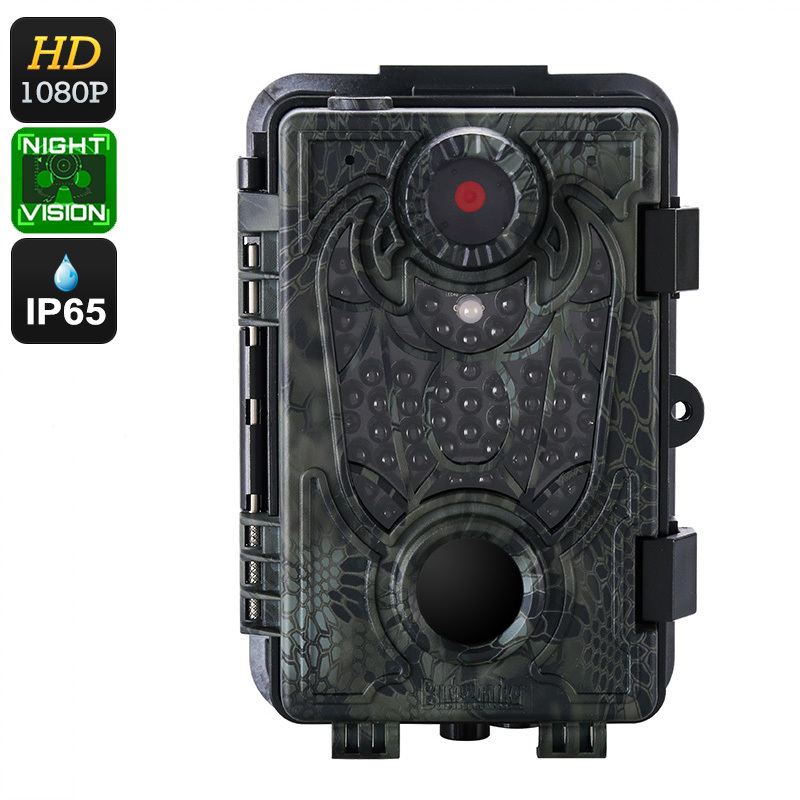 Coming with 46pcs of IR LED lights, this hunting camera is capable of shooting detailed images after dark. It supports 20-meter night vision, meaning that even at night not a single movement stays uncaptured. This truly allows you to analyze the behavior of the game you’re hunting around the clock. The camera automatically recognizes the time of the day and captures black and white images at night and color footage at day. All recordings can be watched back on the spot thanks to your trail camera’s 2.4-Inch LCD display.